I’m aware that I already have two recipes for banana bread on this blog, one completely paleo and the other one made in a blender. 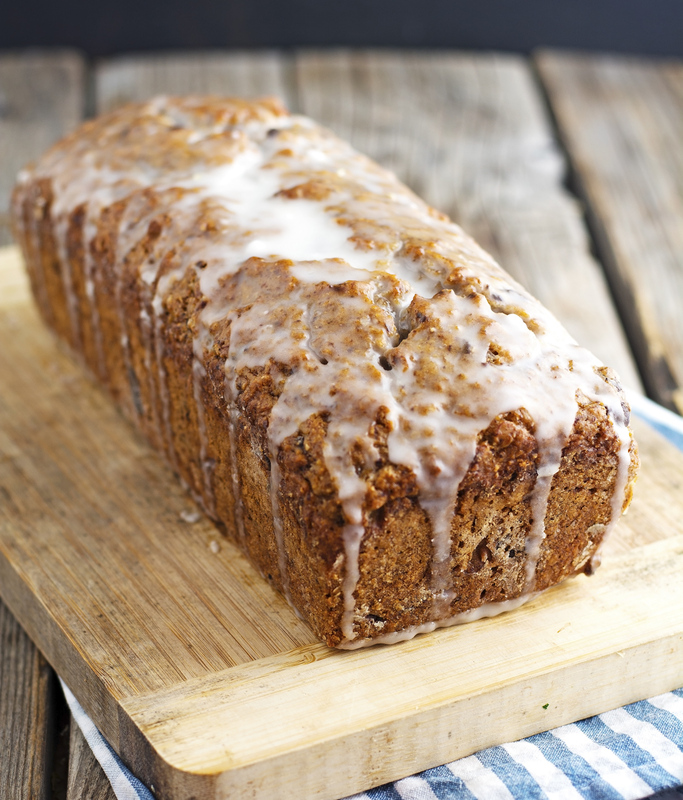 Truth is I never get tired of banana bread. It’s rich, smells great, tastes amazing, and gets better with age. This recipe is notable not only because it’s vegan but also because it incorporates lemons in 2 ways in the banana bread: lemon zest in the batter and lemon glaze on top. It is a flavor explosion. 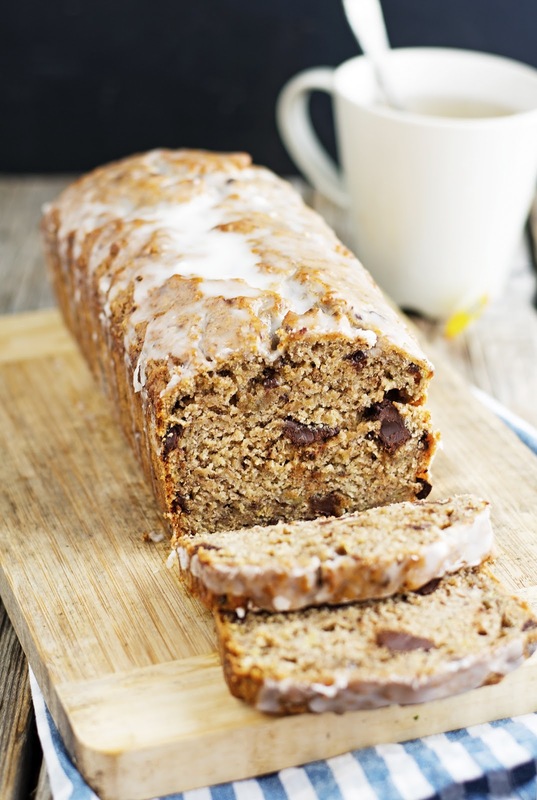 This (Vegan) Lemony Olive Oil Banana Bread is moist, delicious, and dotted with chocolate chunks that make each bite more special than the previous one. The flax eggs bring a slightly nutty flavor which is to-die-for. Which is why I urge you to give this banana bread a try even if you’re not vegan (like myself), you won’t regret it! 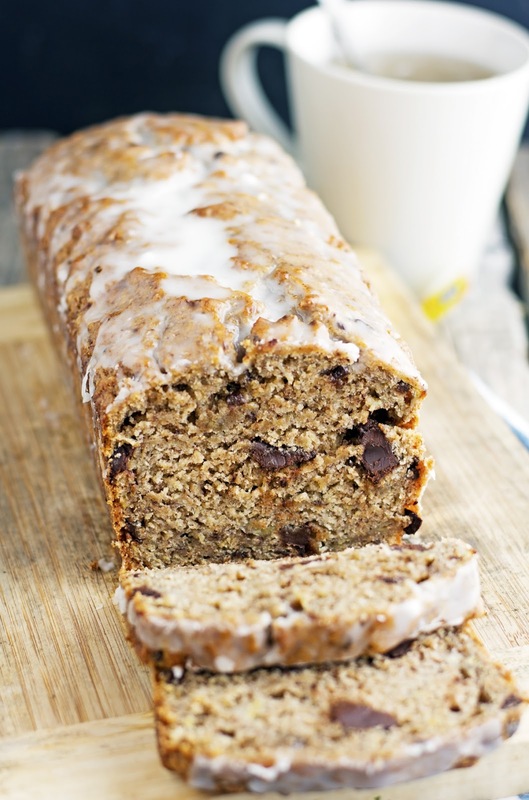 (Vegan) Lemony Olive Oil Banana Bread Print this recipe! Note. If you don’t care about the vegan thing, just sub the 3 flax eggs with 2 eggs and use regular yogurt instead of the vegan yogurt. Preheat oven to 350° (175°C) and place a rack in the middle. Grease a 9x5-inch loaf pan, or equivalent. In a large bowl, whisk together the flours, sugar, baking soda, and salt. Add chocolate pieces and combine well. In a separate bowl, mix together olive oil, flax eggs, mashed banana, yogurt, vanilla, and lemon zest. Pour the banana mixture into the flour mixture and fold with a spatula until just combined, do not overmix. Scrape the batter into the prepared pan and bake for 50 minutes, until golden-brown. Transfer the pan to a wire rack to cool for about 15 minutes, then turn the loaf out of the pan to cool completely. While the cake is cooling, prepare the glaze. In a small bowl, whisk together the powdered sugar and the lemon juice until smooth. When the cake is completely cool, drizzle the glaze on top of the cake, spreading with a spatula to cover. One serving yields 254 calories, 10 grams of fat, 38 grams of carbs, and 4 grams of protein.